Xenia starting pitcher Sam Dralle, of Cairn University, delivers a pitch against a Saginaw batter, July 19 at Grady’s Field in Xenia. The visiting Sugar Beets defeated Xenia, 3-2. 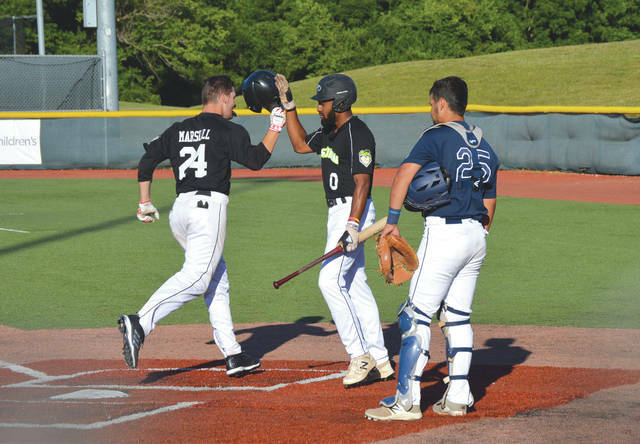 Saginaw’s Cooper Marshall (left) receives congratulations from teammate Josh Williams after Marshall smacked a solo home run in the first inning of Thursday’s July 19 Great Lakes Summer Collegiate League game at Grady’s Field in Xenia. Xenia Scouts batter Zach Bacon (20) strikes out in the fourth inning of Thursday’s game at Grady’s Field. The ball got past the Saginaw catcher, and Bacon reached first safely on an errant throw. XENIA — Engines need all their pistons firing, if they want to perform properly. Baseball teams need all their bats connecting for key hits for the same reason. That’s been the story for 2018 for the Xenia Scouts. 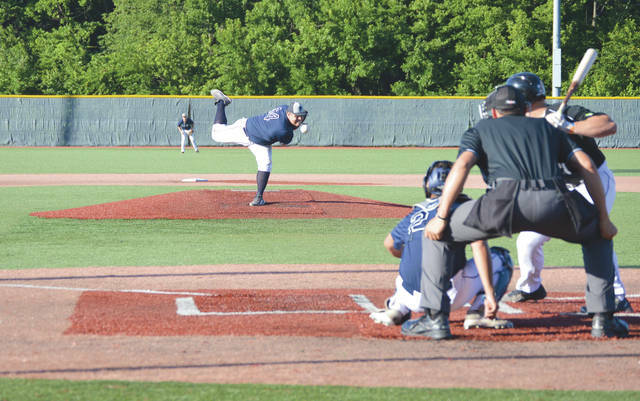 Thursday’s Great Lakes Summer Collegiate League home contests against the Saginaw (Mich.) Sugar Beets was a classic example of what Gnau was talking about. The Scouts lost 3-2, and a trio of Beets pitchers limited Xenia to three hits for the game. No. 2 batter Carson Wright, of Lipscomb University (Tenn.) accounted for two of those hits with singles to center field in the first and third innings. No. 5 batter and GLSCL all star Ryan Bertelsman, of Baylor collected the other hit, also a single to center, in the fourth. The batters in spots 6 through 9 in the Xenia lineup went 0-for-10 with one sacrifice bunt, a hit batsman, two batters reaching on fielder’s choice plays, one reaching on an infield error, and four strikeouts. To his credit, no. 8 batter Truman Brown, from Austin Peay State, made solid contact on deep fly balls in both the sixth and the eighth innings, only to be robbed by the Sugar Beets’ speedy outfielders for deep over-the-shoulder catches for outs. Scouts leadoff hitter Cameron Murray scored on Caleb Eder’s sacrifice fly, then Wright scored on Bertelsman’s infield groundout, for Xenia’s two runs in the the bottom of the first inning. They were limited to just a pair of hits the rest of the way. For Saginaw, Cooper Marshall and Daniel Page both hit solo home runs. Marshall also scored on a sacrifice fly hit by clean-up hitter Max Trucks. The injury bug has bitten the Scouts so badly, that even third-year manager Bubba Cates has been on the disabled list this season. Cates has missed more than a week of the season due to a variety of health issues and was briefly hospitalized. Gnau was managing in Cates’ place on Thursday. According to Gnau, the team hopes to have Cates back in uniform sometime next week. Gnau said Josh Wilson from Cedarville, Adam Goodpastor from Medina and Daniel Earls from Denison University have joined the team this week. Goodpastor pitched a scoreless ninth inning against Saginaw. With Thursday’s loss, Xenia has lost 14 of 15 games since July 1. The Scouts are now 9-24 this season, while Saginaw stays in playoff contention in the GLSCL’s North division with a 19-14 record. The Sugar Beets are currently in third place in the North. 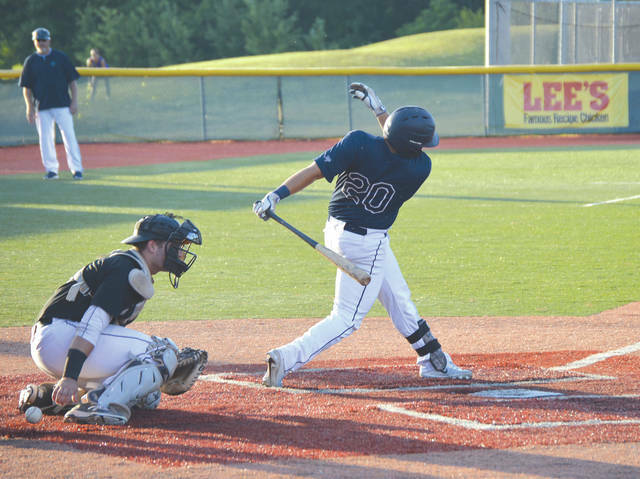 Both teams return to action at 7:05 p.m. Friday, July 20 when the Scouts host the Beets at Grady’s Field on the Athletes in Action Sports Complex grounds.